In our final week of 'Faith, Hope and Love' guest speaker Rachel Carroll speaks about the holy spirit and what it looks like to have a reconciled relationship with the spirit. Rachel is a senior leader at Greater Chicago Church in the US along with her Husband Ian. In week seven of our series 'Faith, Hope & Love' John Ashe continues to talk about reconciliation focusing on the importance of Hope. In week four of 'Faith, Hope and love' Jeff Davidson speaks about reconciliation to mission and looking at the story of David. Jeff leads mission teams at Last Leaf and has partnered with Journey Community Church for many years. This Sunday begins with the baby dedication of Robynne! John Ashe then continues our series 'Faith, Hope & Love' as we look at reconciliation, this week John talks about being reconciled to yourself. Our scripture for this morning is in Mark 12 and Isaiah 1:18. 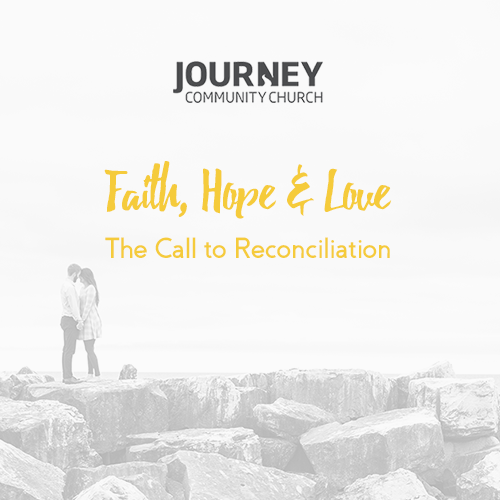 In week one of our new series Faith, Hope and Love we are looking at the call to reconciliation with John Ashe. John begins by looking at the ministry of reconciliation mentioned by Paul in Second Corinthians 5 and how God has reconciled us to himself.